By whatever name you may call them, grifters, scam artists, confidence men; they’re a familiar staple of the theatre. Think of Pirelli in Sweeney Todd, Rooster in Annie, or Harold Hill in The Music Man. Dirty Rotten Scoundrels follows this great tradition with an artful and comedic tribute to the art of the con. Lawrence Jameson, a successful high-end conman, competes with two-bit scammer Freddy Benson to see who can be the first to bilk a target out of $50,000, with the loser leaving town. The result is a ridiculous suite of harebrained and madcap schemes that translate perfectly onto the musical stage. 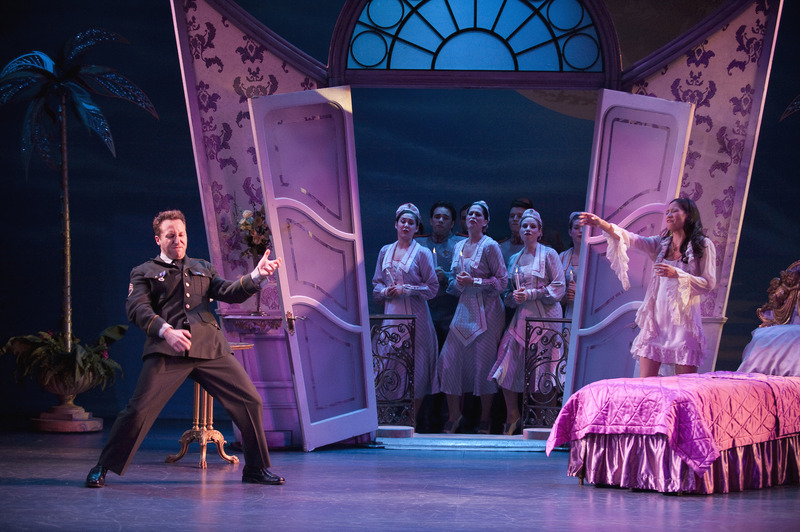 Josh Epstein, Elena Juatco and ensemble in Dirty Rotten Scoundrels at the Vancouver Playhouse. David Yazbek’s music and lyrics (The Full Monty) are fun and catchy and flow seamlessly with Jeffrey Lane’s book. The often crude and vulgar humour contrasts well with the upbeat score. “Great Big Stuff” has Freddy longing for all the modern trappings of success including mink tracksuits and hummers in his Hummer. Andrew Wheeler’s Lawrence Jameson is narcissistically confident and plays well off of his co-star Josh Epstein (The Producers, Arts Club). Epstein, as Freddy Benson, is full of energy and has talent to spare but hasn’t completely made the role his own. Too often, the character seems underdeveloped. Elena Juatco plays the accident-prone American Soap Queen, Christine Colgate, the unwitting mark in Freddy and Lawrence’s unscrupulous bet. Juatco is best known for making it into the top six of the second season of Canadian Idol and has since transitioned her talents to the theatre. Her singing voice is sweet and tender but at times its thinness threatened to give way. Ultimately it didn’t matter, as Juatco is consummately charming and radiates likeability from her first appearance to her final bow. Gabrielle Jones, last year’s titular Drowsy Chaperone, commands attention as world-traveler Muriel Eubanks, one of Jameson’s earlier victims. Jones is a treat as always and shines in a side story involving David Marr (The Drowsy Chaperone, Playhouse) as Andre, one of Jameson’s accomplices. Marr’s deadpan delivery hits the mark every time. Nathalie Marrable co-choreographs with director Max Reimer and together they’ve done a good job making full use of the talented cast; though at several junctures the staging seemed confused and unfocused. Director Reimer can breathe a sigh of relief knowing that his follow-up to last year’s smash success The Drowsy Chaperone is a hit. Reimer deserves considerable credit for injecting some much-needed life into the Vancouver Playhouse’s annual musical theatre productions, after a run of somewhat lacklustre shows in the years previous to his tenure. Dirty Rotten Scoundrels is an uproariously-funny down-and-dirty outing packed with laughs and enough charm and talent to win over even the toughest of critics. 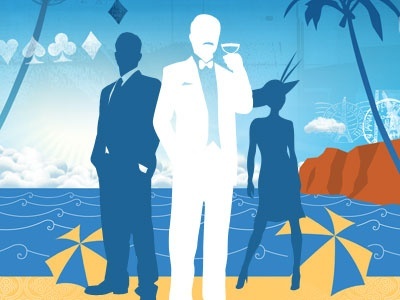 The Vancouver Playhouse Theatre Company presents Dirty Rotten Scoundrels until December 27, 2009 at the Vancouver Playhouse Theatre, Hamilton and Dunsmuir. Tickets are available online or by phone at 604-873-3311.